CSC's Dave Zabriskie, the US time trial champion, wasn't just sandbagging to try to take the Lanterne Rouge. 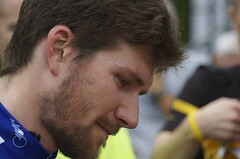 Zabriskie finished more than 30 minutes behind Stage 11 winner Robbie Hunter, and was eliminated. The Team CSC website mentions only “persistent knee pain” as the reason for Zabriskie's exit. He must have gotten caught behind even the Moreau peloton, chasing two desperate groups while riding solo. By the way, this reminds me of one of my primary irritations with the Versus coverage -- they don't seem to address anything that happens after they leave the finish line. I suspect the logistics and time change issues would make this difficult, but there have been several times I've wished they would do an injury update as they finished their “Extended Primetime Coverage,” even if it was from a studio back in the US. Zabriskie’s contract with the CSC team ends this year, meaning that he is looking for a new contract – an effort that is not likely to be helped by his Tour performance this year. Given Zabriskie's much improved climbing, in evidence at the Giro and Dauphiné Libéré, and his TT cred, I don't think he'll have any trouble finding a new team. One minor climb today, with a pancake-flat finishing 100 kilometers. It's the flattest stage of the 2007 Tour. An early break featured CSC's Jens Voigt, Sylvain Chavanel and Nick Nuyens of Cofidis, Benoit Vaugrenard of Française des Jeux, Kanstantsin Siutsoue of Barloworld, and Daniele Bennati of Lampre. AG2R's Christophe Moreau was involved in a crash with Simon Gerrans. Moreau's teammate Sylvain Calzati has abandoned, leading 170 riders in the race. With 81 kms ridden, Chavanel, the last of the breakaway riders, was captured, and Alexandre Vinokourov and another Astana rider have some to the front to try to get the peloton to lower the very fast pace they've been racing. Fabian Wegmann, Gerolsteiner's German champion, Philippe Gilbert of FdJeux, Dmitriy Fofonov of Credit Agricole, and Xavier Florencio of Bouygues Telecom attacked and got a quick 20 second gap. Saunier Duval's David Millar spent a few kilometers bridging, while the peloton soft-pedaled behind, and the gap to now 5 leaders grew to more than 4:20. With 80 kilometers/50 miles to ride, the peloton rides 5:44 seconds behind the 5 leaders. In a stiff sidewind, Astana worked a few riders to the front, and absolutely hammered the tempo. They quickly forced a split in the peloton, with Christophe Moreau the biggest name caught behind. Tom Boonen made the first group, while Thor Hushovd and Erik Zabel were shed immediately, which may help Boonen's green jersey campaign. Moreau has 3 experienced teammates working with him, but can't make up ground on the Astana-powered select group. Rasmussen is in the lead group, most of Discovery Channel, at least 4 Caisse d'Epargnes including Valverde and Pereiro, Cadel Evans and Chris Horner for Predictor-Lotto -- 70 or more riders in all. The Astana-powered group quickly build a gap with Moreau's group, and started closing in on the 5 leaders. With 45 kilometers/28 miles to ride, the yellow jersey group was less than a minute behind the leaders, with Moreau in a group of 14 more than a minute behind that group. The 5 leaders were captured with 38 kilometers/24 miles to ride, and Moreau's group was 2:00 back. Astana pulled its riders off the front until the gap fell below 1:30, then went back to the front to push the advantage. With 10 kilometers to ride, Moreau's gap was 2:30, but his group had grown with the addition of Erik Zabel, Thor Hushovd, and others. With less than 5 k to ride, attacks started to come from the peloton. Christophe Rinero of Saunier Duval made a go, but Quick Step instantly pulled him back. Then Vinokourov launched! He quickly got 30 meters, but was reeled back in by the sprinters' teams with less than 3 kms to ride. In the last kilometer, a number of sprinters slid off the course into the left barriers, including Freddy Rodriguez, Tom Boonen, Francisco Ventoso, Julian Dean, and Fränk Schleck. Only about 12-15 riders were intact at the head of the field after that. Liquigas drove toward the line, and Robbie Hunter of Barloworld outcornered them on the righthander with 500 meters to the line, got a gap, Fabian Cancellara (!) tried to close on him, and two Liquigas riders, but Hunter stayed away to the line, to take his first-ever Tour stage win in his 6th Tour. It's also the first Tour stage win ever by a South African, or any African. Moreau finally crossed the line 3:19 back, and probably lost any chance he had at an overall victory here.